First up...one of the great Orrville teams...the 1963 squad. As always, click each picture for a full-size version. 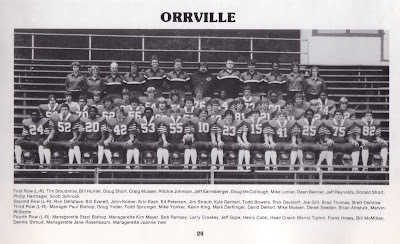 This was the first 10 win season in Orrville history. We had 4 previous undefeated teams, but never a 10 win team. The '63 season was also our first as a member of a conference. We were a member of the Chippewa Conference from 1963 to 1975. I believe this is correct, and someone correct me if I'm wrong, but I believe the '63 season was the first season played at Red Rider Stadium. Enlarge the picture and look at the bleachers, they look pretty new, no?Nevermind....a reader of the blog informed me that this was not correct. Red Rider Stadium was first used in the late 50's I beliece. 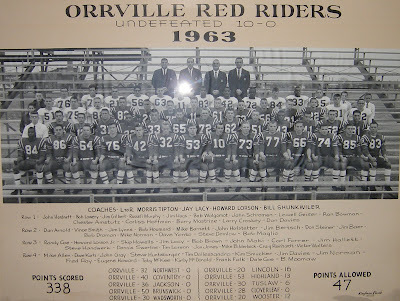 I've now been informed (via the comments) that Orrville's first game at Red Rider Stadium was in 1958 against Norwayne (a win, obviously). That would mean the first Wooster game at Red Rider Stadium was in 1959 (another win). Thanks Mr. R. and "anonymous" commenter for your help in making the site as accurate as possible. Love the sportcoats on the coaches. Classic look. First ever playoff team. Scored the school's first playoff win over Fostoria. Lost to Cleveland Benedictine 7-0 in the state semifinals. The Bengals won state the very next weekend. Covered in detail right here. The '80 team was the 10th undefeated team. This year was the transition of the jerseys from the shoulder stripes to the sleeve stripes. The red jerseys in the above picture have the familiar sleeve stripes that we know today...while the white jerseys from 1980 still featured the shoulder striping. A lot of high socks and neck rolls...don't see much of either anymore. I have very fond memories of that 1963 team as I was 9 years old at the time and never missed a game. I still have a Bob Houmard football card from hist days playing with the Edmonton Eskimos in the CFL. He was a sensational running back who seemed to specialize in returning kickoffs for touchdowns, not that the other teams ever had too many kickoffs in '63. Great stuff - thanks for posting this great picture! THANK YOU!! I've updated the post to accurately reflect your info.